Coffee has become my number one nemesis since the beginning of the year, ever since I was kindly given a Nespresso machine for Christmas. I've never really been much of a coffee fan and no matter what fancy instant or ground coffee you purchase, it's never as good as the luxuriously smooth and creamy coffees you get in your local coffee shop. The bitterness of a homemade coffee never left me craving endless cups 24/7. However last year when I was finishing off endless University deadlines and writing my dissertation, I seriously doubt I would have achieved the high marks I did, let alone even complete the work if it wasn't for the endless Almond Milk Cappuccino's I drowned myself in whilst nestled away in my favourite independent coffee haunt. It became a very expensive habit, and I think I out-coffee'd myself for the whole of 2015 with the amount I consumed over those few months! Fast forward to the end of May 2016 and well - I'm well and truly in love with coffee, and I blame damn Nespresso! I love making my own almond milk lattes/cappuccinos at home, but last week I really fancied a naughty mid afternoon pick me up and the Iced Almond Milk Choco Latte was born. 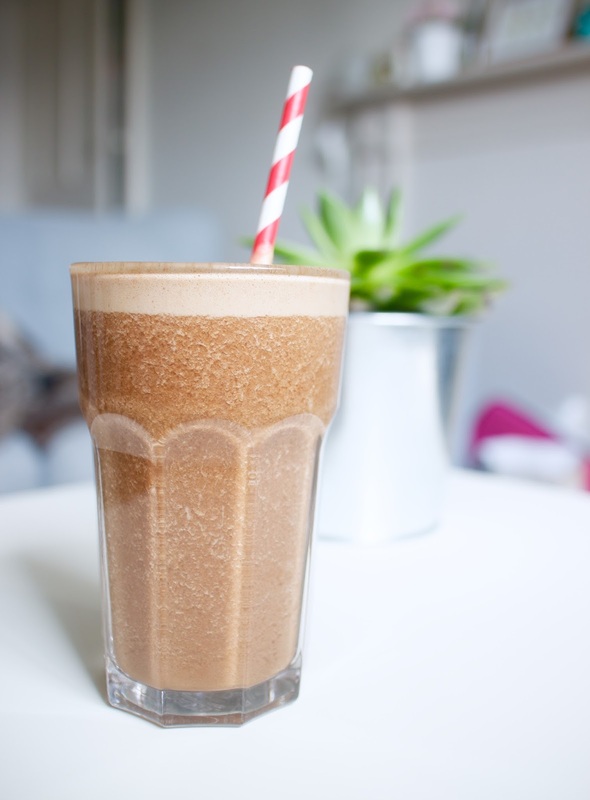 This is perfect if you're after a healthier, dairy free alternative to a Frappuccino with just a fraction of the sugar and calories, and tonnes more health benefits. So not only is it guilt free, it's also super easy to make too! This is a super frothy, creamy, sweet, indulgent, healthy iced latte, perfect for those warm Spring/Summer mornings. I use both bananas and dates for a sweet hit, but I'd recommend using relatively unripe bananas for this as you don't want an overpowering taste of banana, nor do you want this to be too sweet as dates are used too. If you don't have cacao powder, 1tbsp of good quality cocoa powder will be fine. Experiment with your milk too, I can imagine hazelnut milk makes a really tasty drink! I'd recommend this as a treat with a weekend brunch or as a mid-morning boost rather than a post 12pm pick-me-up. It's best to avoid caffeine during the afternoon, and I avoid it as much as possible as I've fount myself still full of caffeinated jitters come bed time! 2. Add the banana, date, cacao powder, almond butter, almond milk and coffee/espresso into a high speed blender such as a NutriBullet and blend for approx. 30-60 seconds until completely smooth. Note: I used the Nespresso Carmelito for this recipe which added a lovely, subtle caramel note to the iced latte! Are you a coffee lover? Do you have a favourite, healthy iced coffee recipe? How was your Bank Holiday weekend?